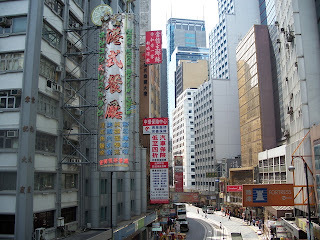 One of the streets of Hong Kong. Vince and Michelle live in the pink topped apartments. 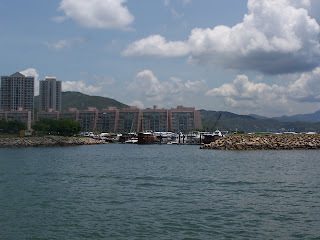 As seen from the ferry. 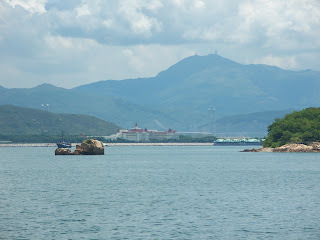 A view of Hong Kong Disney from the ferry. 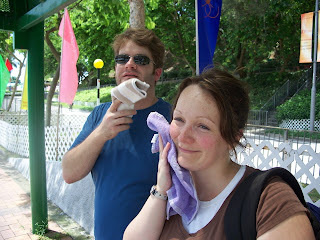 Vince and Michelle demonstrate the importance of wash cloths in a tropical climate. Looks so beautiful! How fun to get out onto the water! I wish we had done that. Hope you are getting some sleep right now. Lets see, it is 2:54 PM Saturday here so you are hopefully sleeping at around 4 am your time. Oh only a few more hours. Beautiful pictures. I love looking at other cities around the world. 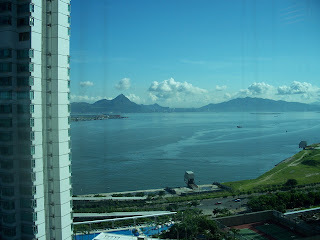 Hong Kong is some place I never expect to be able to travel, but I will soak it in from your beautiful depiction of it all.